Ready for a challenge? We have scrambled up some Earth Day quotes for you to solve in our Earth Day Drop Quote puzzle. Don’t forget to recycle this when you are done! 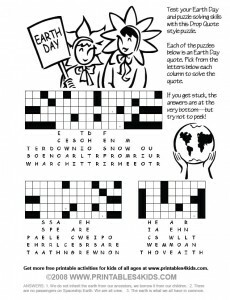 Click on the image to view and print the Earth Day Drop Quote Puzzle full size or download the Earth Day Drop Quote Puzzle as a PDF. Don’t forget to check out the rest of our Earth Day printables.